Daytrotter has been kind to us Canadians lately. Following last week's Born Ruffians live set, the website is dishing out another curt collection from dreamy Toronto, ON folksters Wooden Sky. Featuring four redone cuts from last year's If I Don't Come Home You'll Know I'm Gone, the live-off-the-floor approach brings things down just a notch. Not that tracks like "My Old Ghosts" were heavy-hitters, mind you, it's just that drummer Andrew Kekewich's muted mallet playing on this cut demonstrates a newfound gentleness not heard in his studio album stick work. Smooth, boys, very smooth. 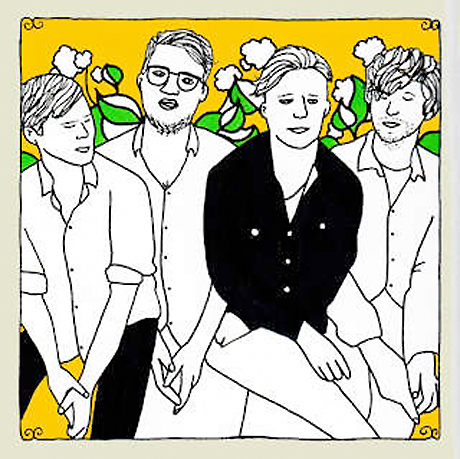 Check out the session at Daytrotter here.